Thank you to all who attended the community meetings in Kenmore and Lake Forest Park on September 20 and 25, 2018. 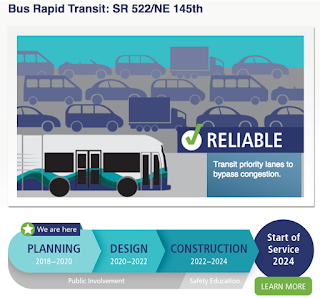 We appreciated the opportunity to share our project updates with you and the time you took to attend and comment on the potential refinements to the representative project for the SR 522 / NE 145th Bus Rapid Transit Project. The Kenmore and Lake Forest Park surveys are now available online and can be accessed at sr522brt.participate.online. Please feel free to provide us with additional thoughts online or share this link with your friends and neighbors who were not able to join us at a workshop in person. The surveys will be available until Friday, October 19. The Seattle/Shoreline community survey will be made live the day of the upcoming meeting noted below. Please check back to share your comments with us online.